This year David called me to do a related piece for their first anniversary -- which is, traditionally, celebrated with paper. 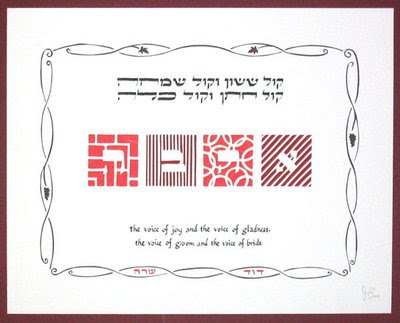 This one is smaller, but you can see how the letters-on-patterns is carried through, as are the warm reds and burgundies of the ketubah; however, here the Hebrew word is "ahava" -- "love." And of course, some grape vines around the piece for joy and celebration.